Fourteen different agencies have a hand in Naples public transportation system under the coordination of Consorzio Unico Campania, which has brought all of these companies together under one ticketing system called Unico Campania. Naples public transportation system includes city and regional buses and trams and intercity and regional metro, cable railway and railway services that move passengers around the city and in and out of its major suburbs in the greater Campania Region. Because there are so many agencies involved and each agency publishes their own system maps, I’ve yet to come across a really good integrated map of the entire system. 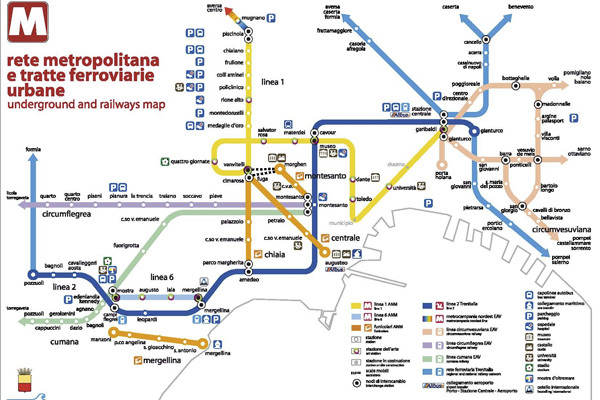 But for transportation within the city there are two very good maps, the Naples Consolidated Metro Map published by the Naples Rotary Club and the Naples Integrated Transport Network Guide (Gira Napoli con Unico Guida alla rete integrata dei trasporti di Napoli) published by UnicoCampania. You can pick one up at any Information Point in the City or check out the ABC Napoli online version. Regional railway lines connecting the city center with the Eastern suburbs around Mount Vesuvius, including Pomepeii, Herculaneum and Sorrento. Bus service between Naples and city centers around Caserta. Several buses run along the same routes as ANM buses and can be boarded with a UnicoNapoli ticket. Of interest is the A4R that can be taken from Piazza Garibalid to IKEA. Bus service between Naples Capodichino Airport and Avellino. Buses leave approximately every hour 300 meters from terminal 1. Bus service around Avellino city center and its suburbs. Bus service around Benevento city center and its suburbs. Bus service around Caserta city center and its suburbs. 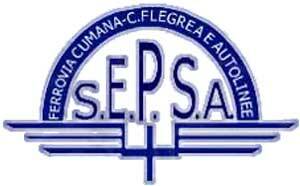 EAV Bus was founded in 2008 to consolidate bus lines formerly run by Circumvesuviana, S.E.P.S.A. and Metrocampania Nordest. They operate numerous routes throughout the Campania region including a Pompeii to Vesuvius bus that operates June through October. Bus service around Salerno city center and its suburbs.